Cristina Valenzuela, Kate Higgins, Vic Mignogna et al. The end of the world has begun. The rampaging Meicoomon, now fused with Gatomon, has changed into the powerful Ordinemon. As foretold by Yggdrasil, the Digital World engulfs the Real World. Confronted by impending doom, the DigiDestined resolve to face it head on. Homeostasis, in order to deal with the uncontrollable Ordinemon, executes the final plan for the Real World. 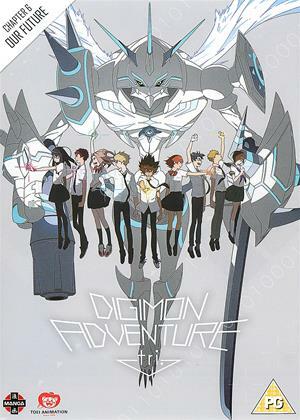 To prevent the coming destruction, the DigiDestined and their partner Digimon continue their frantic fight. The time to make the final decision has arrived.